Growing: Easy to moderate Back in Jamaica, one of the most sought after marijuana strain is what is locally known as Jamaican High Grade. It is a pure old school sativa and indica hybrid very popular for its incredible characteristics. 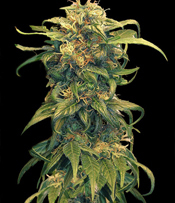 Yardie Seeds went a little further and crossed their own with the very popular UK Cheese cannabis strain. The result is a hybrid now known as Jamaican Cheese. It is a weed plant that has a musky cheese flavour courtesy of its Cheese parent and can grow in almost any environment whether indoor or outdoor. Flowering time for Jamaican Cheese can be expected in as early as 53 days counted from the time it enters the vegetation stage. Yield is just about average for this pot plant and the grower can expect to harvest around 300 grams/m2 of potent cannabis buds. The effect when smoked is a terrific combination of its sativa and indica genetics as it will induce a strong head high finishing off with a sociable and relaxing all around buzz.